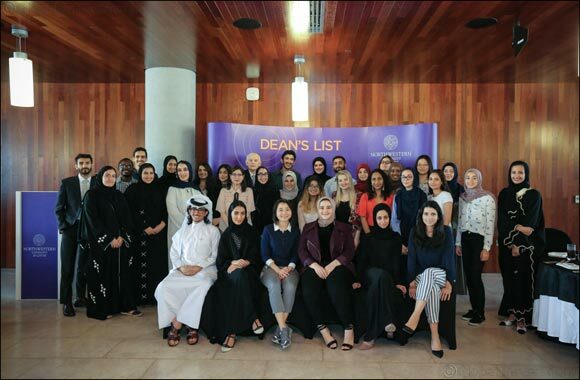 Doha, Qatar – November 20, 2018 – NU-Q students named to the Dean’s List last year were honored at an awards luncheon hosted by the dean. Nearly 100 students received a certificate to mark their success at the event. To be considered for the dean’s list, communication majors must have achieved at least a 3.75 grade point average (GPA) out of 4.0 on three graded courses, and journalism majors must have achieved a 3.7 GPA. Students who are on exchange at Evanston and completed five graded courses, may be considered for dean’s list if they earn a 3.75 GPA. Communication Program: Abdulla Fahad A E Kamal, Abdulla Yousef S Y Al-Hor, Aimen Ahmed Jan, Alessandra El Chanti, Alia Abdulaziz M A Alkhater, AlJawhara Hamad Al-Thani, Amal Ahmad AlMuftah, Amal Zeyad Fathi Ali, Amin Kamal Yassin Ahmed, Amina Niksic, Ammar Younas, Asmaa Benkermi, Ayza Sheikh, Basmah Kamran, Azmi, Bothayna Talal S S Al-Mohammadi, Dana Abu Shanab, Fatema Jassim Al-Theyab, Ge Gao, Hassan Mohammed H A Al-Jahni, Hisham Khalil Ashour, Ibtesaam Mohamed Afroz Moosa, Jawaher Salman Mohamed Abdulla AlMoawda, Lama Abdallah Zaidieh, Lubna Mazin M K Mohsin, Maha Essid, Maha Ali Kuwari, Maryam Jassim Y M Suwaidi, Maryam Saud Al-Khalifa, Mohammad Mahmoud Abdel Hafiz Qandas, Muhammad Muneeb-Ur-Rehman, Muhammad Humam, Muktar Omokayode Sanni, Njoud Mohammed Al-Mana, Noof Abdulaziz A T Al-Subaie, Noor Ahmed M A Own, Nouf Fahad Q.A. Al-Thani, Noura Khalid Omer Ibrahim, Omar Ali AlAnsari, Rui Xin Oh, Samaya Bilal Deeb Mahmoud, Sana Mahdi Reda Ansari, Sarhan Khan, Shaikha Khaled Y I Alderbesti, Shaikha Salman Mohamed Abdulla Almoawda, Syed Muhammad Erzum Naqvi, Tamadur Khalid Al-Mannai, Thamer Nasser Al-Thani, Tony Ghazal, Yassine Ouahrani, and Younes Mana. Journalism Program: Abdulrahman Abdulla A R Al-Nuaimi, Albandari Mohamed K N Al-Kuwari, Asmahan Ibrahim Faten Qarjouli, Ayah Samir M M Awrtani, Boshra Nasser S H Al-Meraikhi, Bothaina Saoud K. H. Al-Thani, Danna Takriti, Fareehan Salah Zaki Moustafa Elgakhlab, Fatima Hassan, Fatima Abdulla Al-Saai, Habibah Abass, Hadice Tahire Koc, Haya Ibrahim Al-Mannai, Haya Khalid Al-Thani, Hissa Nasser Al-Hitma, Ifath Arwah, Inaara Nizarali Gangji, Jawaher Mohammed K. E. Al-Khater, Khadija Mohamed Islow, Lolwa Faleh Al-Thani, Maha Hassan, Malek Al Manaa, Manar Ahmad Al-Jamal, Mariam Abdulwasea Hamood Noman Al-Dhubhani, Maryam Abdulla I. H. Badr, Muhammad Saad Ejaz, Muhammad Sikandar Ali Chaudary, Nada Ahmed Qaddourah, Neha Ara Rashid, Noor Mazen Abdulqader Abunab'a, Oma Zuhra Seddiq, Razan Hussam Ghadban, Rida Zahid Hejaze, Rouda Hamad Al-Attiyah, Rumeysa Cihan Koc, Sana Zehra Hussain, Sara Hamad K. H. Al-Thani, Sara Mashhood Sarwar, Sarah Yousuf Zainel, Shafaq Zia and Syeda Shageaa Naqvi. NU-Q offers Bachelor of Science degrees in journalism and communication with curriculum and courses available to NU-Q students that provide a flexible framework and help them develop a range of skills as they work toward their highest potentials. NU-Q is dedicated to excellent education, advanced research, and access to technology as well as the personal intellectual growth of each student enrolled.